The CAS challenge this week is to use dry embossing. I thought and thought about this and decided to do a couple things different with this challenge. First…instead of using white as my base color, I decided to go with Pool Party. The other thing is that the challenge is to use dry embossing. I wanted to keep my card very clean so I went with just the simple cross stitch line of dry embossing. I think that overall it ended up being a very clean and a little different card! Pool Party 3 5/8 x 3 5/8, run through the Cross Stitch Needlepoint Embossing Folder. Stamp the greeting in Basic Grey. Add to Whisper White 3 3/4 x 3 3/4 and add this layer to the card base using dimensionals. Punch 3 Whisper White Petite Punch flowers. Punch also from Pear Pizzazz and cut to make leaves. Add to the back of the flowers. Punch the 4 petal Itty Bitty Punch from Island Indigo and add to center of each flower. Add a Pool Party Candy Dot to the center of each flower. 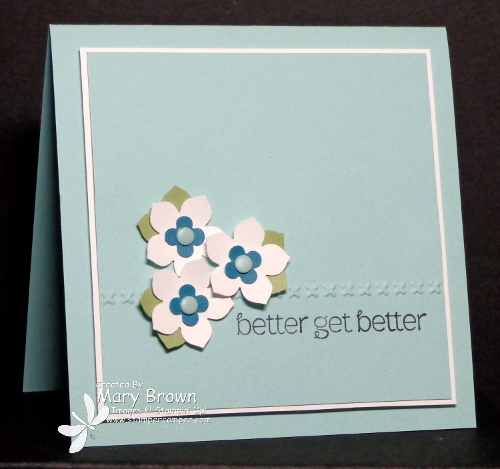 Add flowers to card front using either glue dots or dimensionals. 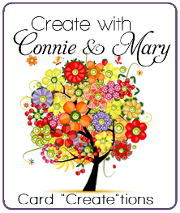 JOIN US for our NEW Card Create-tions Edition featuring stamp sets in the Main and Occasions catalogs! * Designers Melissa Davies, Debbie Henderson, Deb Currier and Nicole Tugrul are joining us! This entry was posted in Challenge, Clean and Simple (CAS) and tagged A Dozen Thoughts. Bookmark the permalink.